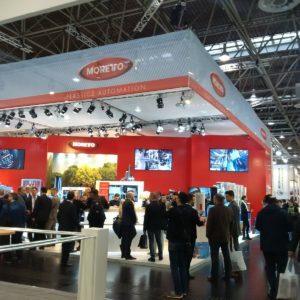 At this year’s K show the Moretto Group exhibited its Moretto and Contrex brands in separate booths both located in Hall 11. This was in addition to positioning their popular Moretto in Motion articulated lorry outside Hall 12. Together this afforded Moretto over 400sqm of exhibit space to showcase its latest technology and innovations to visitors. The signature display at Moretto this year was its Moisture Meter system installed in-line on an Engel injection moulding machine and running a precision optical mould. Moisture Meter is the cap-stone in Moretto’s continuing quest to meet the requirements laid out by the larger Industry 4.0 initiative. Moisture Meter forms the final part of the “Drying 4.0” project started by Moretto to create a true closed-loop and precise drying system capable of automatically adapting to changing conditions and optimizing energy consumption. 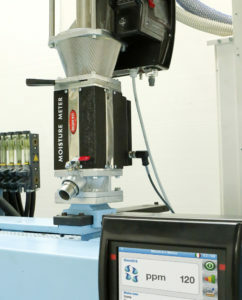 The Moisture Meter project is the culmination of a nearly decades long research and development project conducted by Moretto to revolutionize how companies approach drying for precision and technical applications. In addition, at K show Moretto introduced the X-Comb Dryer. This dryer joins Moretto’s extensive family of drying solutions and has been developed specifically to meet the stringent requirements of the medical industry. Utilizing Moretto’s patented OTX hopper technology and capable of achieving a -52°C dew point, this dryer promises to deliver unparalleled performance for small batches and technical applications. Moretto will next be exhibiting at Expoplast on November 30-December 2 in Montreal, Canada, and PlastEurasia on December 7-10 in Istanbul, Turkey. Thank you for sharing the great news from our very successful K 2016!